Delicious, healthy and quick to prepare. 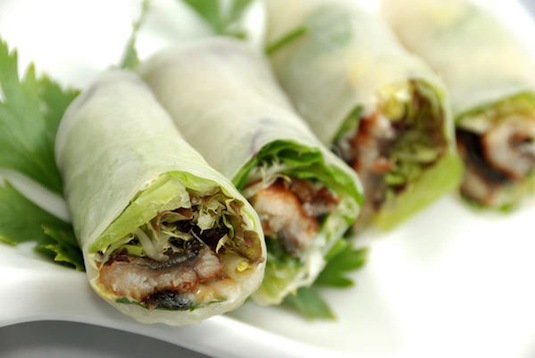 These mouthwateringly good fresh spring rolls will quickly become a favourite with your friends and family this summer. To make the peanut sauce, heat the oil in a small saucepan over medium heat. Add the garlic and chilli and cook, stirring, for 1 minute or until aromatic. Add the peanuts, water, coconut milk, lime juice, fish sauce and sugar and cook, stirring, for 5 minutes or until sauce thickens slightly. Remove from heat and set aside to cool. Place the noodles in a small heatproof bowl and cover with boiling water. Set aside for 5 minutes to soften. Drain well. Soak 1 rice paper sheet in warm water for 30 seconds or until soft. Drain on paper towel. Place on a clean work surface. Place 2 prawn halves along the centre of the rice paper sheet. Add a little of the noodles, bean sprouts, carrot, peanuts, mint and coriander leaves. Fold in ends and roll up firmly to enclose filling. Repeat to make 20 spring rolls. Place on a platter and serve with peanut sauce.